Beautiful, blond Russian photographic models and half-sisters, Anna and Vika, are excited, but also a bit nervous, as their trans-Atlantic flight reaches its destination of Los Angeles. Vitaly, their photographer in Russia, has sent them at the request of his brother, Mikhail, who will photograph the sisters at beach locations along the Pacific Coast near Santa Barbara. Mikhail—a fiftyish-looking bodybuilder with a salt and pepper goatee—meets the sisters, and they are soon heading north, the girls transfixed by the sights of Los Angeles and the California terrain en route to their new venue. Mikhail drops them off at a motel, suggesting that they rest up. This they do, but they awaken to growing needs for a fix—alcohol for Vika, heroin for Anna. Mikhail returns and takes Vika with him to pick up the necessary booze, needles, and drugs. He’ll pick them up in the morning for a shooting day at the beach. In this suspense-filled novel, board-certified 25-year veteran criminalist John Houde shares his knowledge in this field—much of it published in the Journal of Forensic Sciences and other professional venues—with both young adult and older readers seeking an exciting tale of crime and murder investigated at crime scenes and in crime labs of California’s police and sheriffs’ departments. Evidence gathered by these organizations comes to be used by the FBI to bring down an international ring of criminals engaged in human trafficking of young women. The crime and mayhem are lightened by a little American-Russian romance and the close relationships that develop among the ‘good’ characters. Houde intricately weaves many threads into his story, with parts played by colorfully crafted characters, among them the Russian trio; Santa Barbara Police Department criminalist Paul Connert, who is determined to help Vika find her missing sister; SBPD officer Kyra and her partner, Tina, a University of California-Santa Barbara graduate student, whose thesis involves research on the method of nanoparticle-mediated medication delivery to treat drug and alcohol addiction; and a crime investigator turned criminal right under his coworkers’ noses. 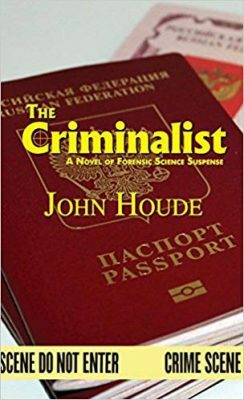 What makes Houde’s novel most fascinating, however, is his skillful use of accessible language to enable his readers to enter the contemporary world of criminal investigation and see how forensic evidence is collected, examined, and used to solve crimes that might otherwise never be solved. If this book piques your interest in this scientific field, you’ll want to read Houde’s Crime Lab: A Guide for Nonscientists. 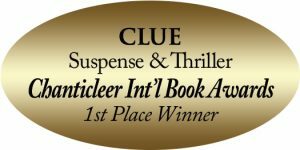 The Criminalist won First Place in the 2017 CLUE Awards.